Do you have a super quick, super easy, go-to recipe that you always resort to when nothing else is working? If you do, share it in the comments! Mine has always been Eagle Brand’s Foolproof Chocolate Fudge. Now, I don’t believe in the word “foolproof” as I’ve been known to mess up “foolproof” recipes or projects, but this fudge just always works. It takes no time at all to make, and then you just throw it in the fridge and you’re done. You don’t even have to turn on the oven! Well, this was one of those weeks. One where I had a recipe I was really excited about, but no matter what I did, I just couldn’t get it to work. So I thought I would do a reset. Reset my mind. Reset my baking. And what better way to reset than to make something that I know will work? 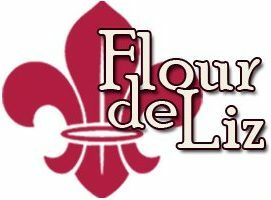 But even though chocolate fudge is delicious, it’s also kind of boring. I like to give it a little extra excitement! This recipe has always been one of my go-to recipes for holiday gifts. And I know it’s a little bit early for holiday gifts (though, it’s never too early to plan! ), but this recipe works just as well for Halloween, Thanksgiving, holiday baking, or anything in between. It’s like having a drink and some chocolate by the campfire! 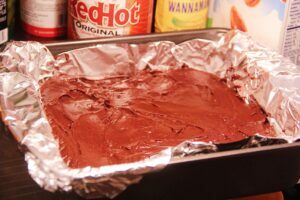 Line an 8x8 pan with nonstick foil. 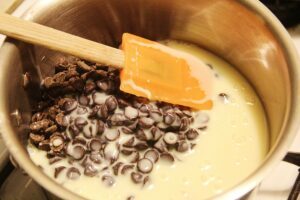 Over low heat, stir chocolate chips and sweetened condensed milk until the chocolate is melted and the mixture is smooth. Remove from heat, and add bourbon, Liquid Smoke, and salt. Pour into lined pan and refrigerate 2-4 hours, until the chocolate doesn't give when pressed lightly.